Just finished with SANOG 26 conference and tutorials. It went very nice. Interestingly this time conference did not start early morning like it did in SANOG 24 at Noida. It was rather late in afternoon. Also, on very good note – there were less Govt. bureaucrats to bore attendees with usual stuff they always talk about but have very little idea. One specific interesting presentation was Opportunities and Challenges for Broadband Wireless in India by Prof Abhay Karandikar (from IIT Mumbai). In start I felt it to be usual crappy 5G talk but later realized it was much more interesting. I loved the idea “Have 2Mbps everywhere static broadband” and not some absurd number on mobile wireless broadband as we hear in case of 3G/4G. Although 2Mbps now is much slower and I would rather suggest that we target for 10Mbps everywhere (something which can be supported by copper/coax/fiber hybrid) but anyways it was nice refreshing talk. He did a nice job to state that the way we are proceeding on vCPE concept, we are moving with further complexity on the edge CPEs. Number of technical challenges are breaking off the fundamental requirement which was to make things simple. On conference day 2 presentation from Vivek Nigam on ROA using RPKI was a nice intro to RPKI and the reasons why it’s not just another form of IRR deployment. On important note we (at Hurricane Electric) give a green signed key in front of prefix on our bgp.he.net tool. I will do a detailed blog post about RPKI later in sometime. Attack Trends and Mitigation (from Matt Jansen) was nice. What always excites me is the status of IXPs across the region (excluding India of course which is messed up). BDIX in Bangladesh, NPIX in Nepal etc are doing really great. Wherever I go, the fact that I am from country with dysfunctional Internet Exchange bites me. Except for NIXI Mumbai, all other NIXI’s have pretty low traffic than that of BDIX alone! Note: NIXI Chennai is somewhat standing in comparison while NIXI Delhi/Noida has very low traffic after they recently shifted to Netmagic Sector 63, Noida facility. One of very important part of so called “Digital India” push by Govt. of India should be a functional Internet Exchange with good policies. India’s Internet core need some serious fixes. Another interesting thing I found was the presence of cell phone towers just everywhere. Quite a few of them were using microwave backhaul while lot of them seemed to have local LCO fiber based backhaul. This one clearly is on fiber backhaul (notice the cables around and absence of microwave). While most of road side towers appeared to be microwave backhauled. Clearly top metros are getting desperate for voice and data connectivity while limited spectrum, lack of competition in broadband and lack of IP telephony is all together killing a possible good market. Open last mile and middle mile access of BSNL’s infra. Just like they are moving their towers to a subsidiary (news here), they also need to make their fixed line copper infra and long haul domestic fiber for use by telcos so telcos can compete over it. It’s seriously huge and seriously unused infra. Take for instance they have got around 37k exchanges (basic Tier 1/2 facilities with fixed line copper termination) and over 600,000 Kms of fiber optic cables connecting them (as per data from BSNL site here). Permission for IP telephony so that private VoIP companies can offer DID and call termination in India and this will result in migration of voice traffic over data networks freeing up hell lot of strain on limited 2G/3G spectrum across metros. More of wifi ofload of calls for native telecom calls. (Remember latest iOS offers wifi calling, none of Indian telcos are using that yet). Could be regulatory reason since haven’t seen any similar VoIP >> PSTN based app/offering from any telco yet). All all major enterprises across big cities have decent office wifi, this can remove strain of that kind of voice traffic from cell phone towers. This time I travelled on flight booked via ibibo (quite cheap flight), stayed in hotel booked via Oyo rooms, travelled across Mumbai in local train, Uber and OLA. I occasionally ordered food via Foodpanda (and it was good!). 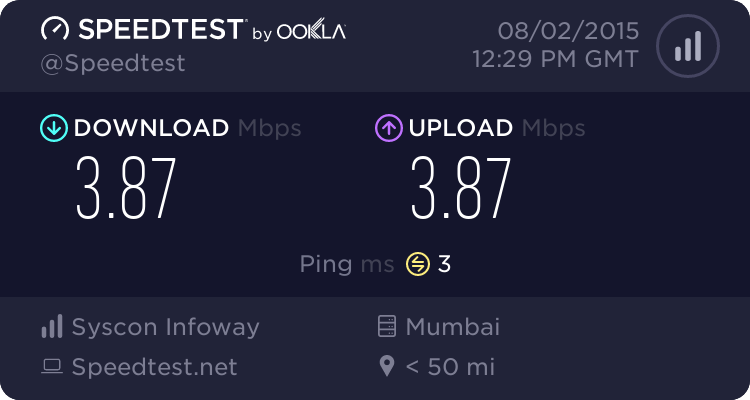 Furthermore ISP at hotel was relatively local Mumbai operator – Syscon Infoway and they had a wired wifi router installed in each room (backhauled over wired cat6 to their core). I was getting 4Mbps symmetric speeds with quite low latency. I can guess it was either fiber to the hotel or a fiber/coax hybrid. In short this was much better than travelling via crappy airline booking site, staying in traditional Mumbai hotels or roaming across city in usual taxis or using hotel wifi with creepy proxy based authentication and sub 1Mbps speeds. So without going into fine details of companies I named above, as consumer I very much enjoyed it and it was easier life. So competition just takes care of issues because someone can make money while solving problems. Mobile apps and internet play an important medium here and I would very much like to work in direction of fixing our internet connectivity problems. This reminds me of very nice post by Matt at wirelesscowboys blog – WISPs to AT&T Customers – We Got This.